Curlin designs gorgeous whimsical embroideries. 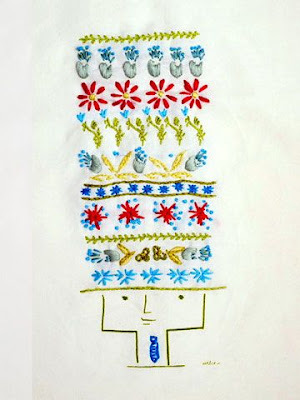 Her cute Flowerguy and Flowergirl embroidery kits are now back in stock! 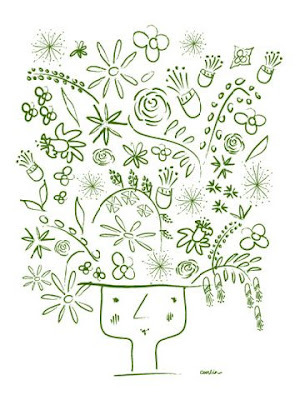 The image above shows a completed Flowerguy, nice top hat right? Curlin's designs are hand silk screened onto an 18 x 18 linen cotton blend and they're very popular so get in quick! While you're there check out her other flowery products, her designs would make lovely gifts for anyone who loves a bit of Spring time frivolity. i blogged about your help links (for the fire victims) today. your bushfire bunnies are so cute! hellloooooooo from pippingtooth studio! thanks a million for featuring my new embroidery kits, rebecca! and a warm austin, texas welcome to all your readers. I only started embroidery about 6-8 months ago but oh how I enjoy it. I'm rather picky and specific about what I sew but these patterns suit me perfect! I'm such a sucker for whimsical things! I love it! I really love this. Just gorgeous. You truly do find some of the most beautiful things I've ever seen!